3. The daily challenges we face when we try to control the quality of thoughts that arise in the mind are dealt with using simple examples. 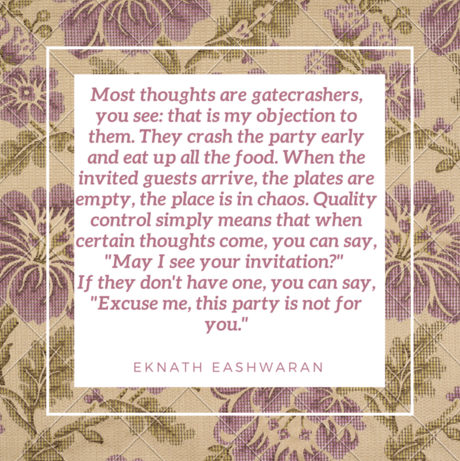 As a working mother, the most important takeaway for me is this: I have seen a positive change in my 9-year-old son when I cite Eknath Eashwaran's 'quality control' arguments to him. It makes sense to him. Using specific tips from this book, it is possible to instil the habit of training children to watch the quality of thoughts that arise in the mind. Are there books that you would recommend on this subject? I will definitely check this book Swapna. Thanks for the review.I definitely need some tips to control my thoughts. You've convinced me Swapna! Going to check out this book next. Reading this book at the moment on mindfulness by John Kabat Zinn - Wherever you go, there you are. It's an easy read on being more mindful daily. Thanks for sharing. @Asha - Good to hear that you are keen to read this book. I am certain that you will find it as useful as I did. @Vishnu - Awesome, go for it, Vishnu. Do let me know how you connect to me. I will check out the book you've recommended, thanks for that. How to control the quality of thoughts is something that I must read. The book sounds inspiring and thought provoking. Thanks for sharing about it, Swapna. Will look out for it! Controlling quality of thoughts is paramount. It is what makes us or breaks us. @Shilpa, I hope you find this book as interesting as I did. Do read and let me know your thoughts on it. @Seeya - Absolutely agree on that, do keep reading and sharing your thoughts.